My friend's father is a locksmith, and my friend commissioned me to make a lockpick for his dad as a gift a couple months ago. His dad liked it and wanted me to make another type of pick for him. I finished this one yesterday. I have most of the piercing done on my copper vase, all that's left are the difficult areas. The areas that are hard to get to even with deep saw frame. Now things are going much slower. I am looking forward to getting this piercing finished. I am still working at the piercing on my vase. I am working slowly but steadily. I would guess I am about half done. I have been keeping track of the number of saw blades I have broken, just out of curiosity. I have broken 36 so far. I don't have a lot of patience for piercing, which is why I work at it for short periods of time. I really liked making my other two hammers, so last week I started making a chasing hammer. 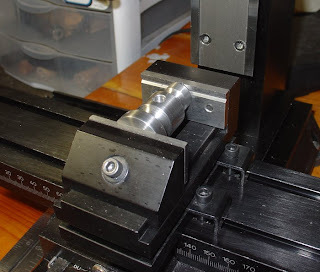 I did almost all of it on the lathe, except for the hole for the handle which I drilled on the drill press, then milled on the milling machine. This is how it looks right now. I just need to clean it up and heat treat it. I don't have wood for the handle yet, so there's no hurry to get this part done. The exhibition Putting the Band Back Together, which I am participating in, will be at the Georgia Museum of Art in Athens, GA, Aug 23 - Nov 2, 2008. I finished my 2nd hammer today. 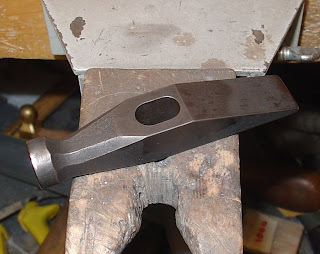 I hardened the head and finished shaping the handle. The handle of this one is kingwood. I like both of them, but I think I will keep the 1st hammer at my bench to use. I like the feel of the lignum vitae better. I finished my first hammer today. The handle is lignum vitae, a very hard wood. 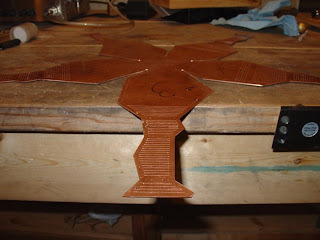 I ordered it as a 1" x 1" x 12" block and shaped it on the belt sander. It took a lot longer than I thought. The head seems to be on tight. I hammered it on and put a small wedge in the wood. I will need to wait till I use to to see if it stays tight. 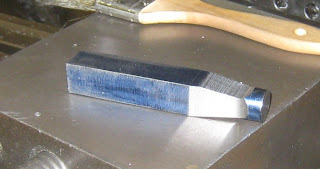 I enjoy making tools, and using tools that I have made. As long as they are equal or better quality than ones I could buy. And of course they must look better, that's just as important. 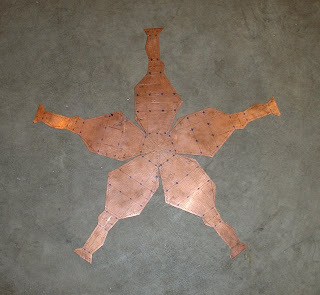 I thought I would post a photo of the first piece I made in metal. 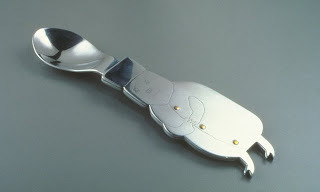 It's a spoon. 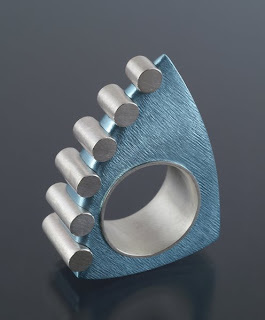 I made it fall semester 1996 in the beginning jewelry and metalsmithing class at the University of Iowa. Its aluminum with brass rivets. 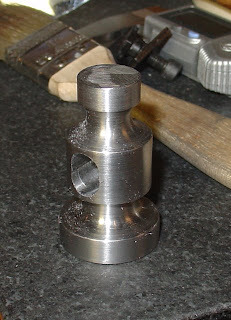 I remember I considered anodizing it, but decided not to cause it seemed most people got pretty poor results. 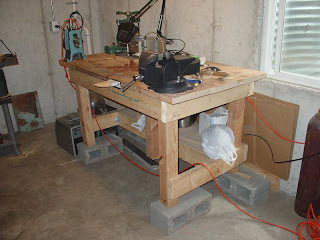 I needed to raise the table up 5 1/2" to make the bench pin the same height as the one on my bench. So Saturday I got 6" high cinderblocks at Menards. I am happy with it. 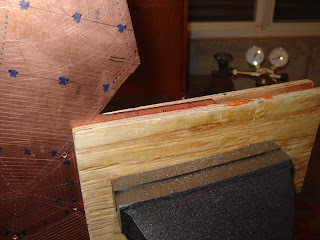 I finished filing the edges of my copper vase and put a rivet in the hole I had drilled in the wrong spot. I think it's ready to start piercing. I need to do something to make my work area more comfortable to sit at. 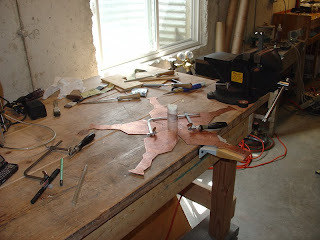 The thing is too big to work on at my bench, so I have to use my work table which is too low for sawing. I think I need to get cinder blocks or something to put under the feet of the table to raise it. I tried sitting at a lower height on a little stool but that was not very comfortable. 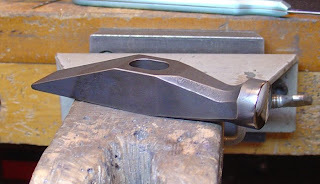 This is the 2nd hammer head I made during the class. It's about the same as the one in my previous post. This one is not quite finished. I started with round stock, cause there wasn't any square stock available in the right size. I cut one end on the lathe to the diameter I wanted the face to be. Then I cut the rest of it square. 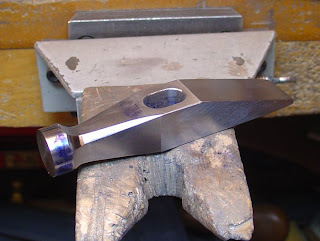 I put the vise at an angle to cut the tapered part behind the face. 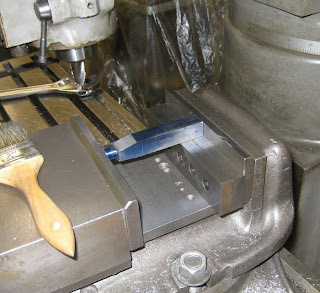 I put it in the vise at an angle to cut the cross peen. 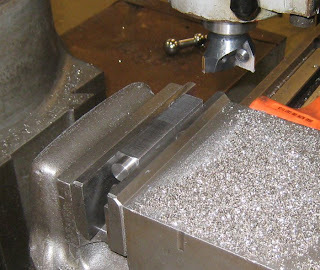 These photos are after I filed out the machining marks, and ground a few parts by hand. This is how it looks right now. I need to sand it. I don't know if I will harden this one, I might just work harden the face. 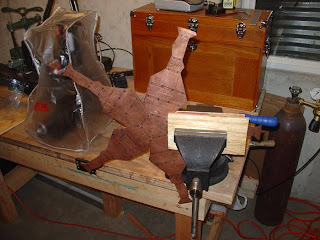 A few days ago I finished the hammer head I was making. 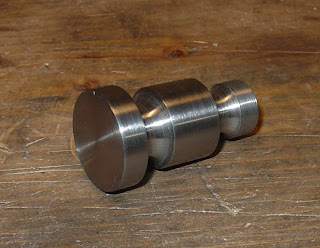 I did most of the work in my machine shop class, and some of the work at my studio. I case hardened it last week in class. I really only case hardened it cause I wanted the mottled gray color, but I wasn't very happy with the way it looked. I tempered it and got some violet/blue colors on the lighter spots and I thought it looked good after that. After the case hardening there were some areas on it that look sort of etched. It's not scale, I dont know why it happened, I don't know much about case hardening. 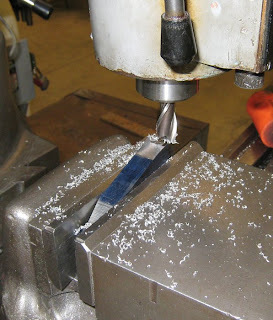 Last night I ground some of the edges of the vase on the belt grinder. 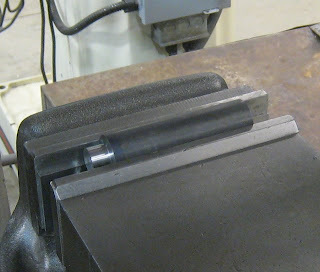 Then I put it in a vise and was filing the parts I couldn't reach with the belt grinder. I will work on it some more today. 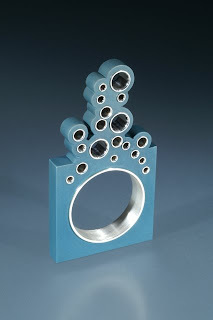 I found out today that I got 1st and 2nd place in the rings category in the Lapidary Journal Jewelry Artist Jewelry Arts Awards. The winning pieces will be published in the Sept issue of Lapidary Journal. I got 1st place in the rings category in 2006. Last year I didn't enter because I missed the deadline. I had marked it on my calendar as April 1st when really it was March 1st. So it's good that I had 2 pieces win this year to make up for missing last year.